In July 2018 we moved from our former location to the new Austmann Brewery & TapRoom. Under the same roof, the TapRoom offers visitors a unique look at our production and a chance to meet the team. Located just a short bus ride from downtown, we are open Tuesday – Saturday, offering a range of our beers on tap as well as tours and tastings for groups of 10 or more. A range of bar snacks are available, including gourmet grilled cheese sandwiches from Melt, another Trondheim start-up. Visit our in-house TapRoom, the best place to try out our beer and strike a chat with us. Get a tour of our brand new brewery and get to know the people behind the beer. See our upcoming events, or see what we can offer here. 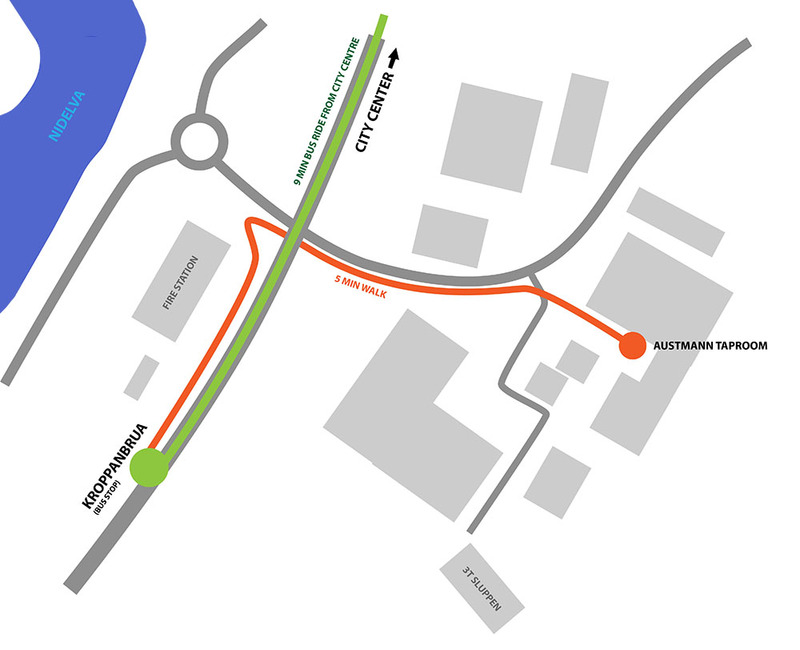 From the city centre, grab bus number 4, 6, 9, 11, 38 or 46 and take the bus for 8-9 minutes until bus stop “Kroppanbrua”. Walk back along the main road for 150m, take a right to the underpass and walk uphill. Look for a large yellow building on your right side. © 2019 Austmann. All Rights Reserved, Austmann Bryggeri AS.